Building a structural header for a garage door opening can be handled on the jobsite and will offer the same structural support as more expensive solid wood beams. 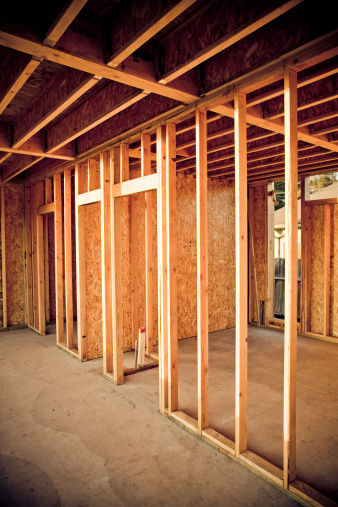 The procedure for constructing a header for 6-inch exterior wall framing can be modified for any wall thickness. Local and national building codes have specific structural requirements pertaining to beam sizes to span specific wall openings relative to the wall loads, so consult your local building department before beginning this project. Cut three pieces of 1½-inch-by-11½-inch lumber to the width measurement of the garage door rough opening plus 12 inches. Rip 11-inch-wide strips of ½-inch plywood, using a circular saw. Lay a single piece of the 1½-inch-by-11½-inch lumber cut in Step 1 across two sawhorses or on a flat surface. "Paint" a solid layer of wood glue over the face of the 1½-inch-by-11½-inch board, using a small foam paint roller. Apply a strip of the 11-inch-wide strips of ½-inch plywood cut in Step 2 on top of the board, flush with the end. Cut enough plywood pieces to cover full length of the board. Tack plywood in place with 6d box nails. Spread a coating of wood glue over the surface of the plywood strips installed in Step 4. Place a second piece of the 1½-inch-by-11½-inch boards cut in Step 1 on top of the plywood. Align ends and sides with first 1½-inch-by-11½-inch board and nail in place with 16d nails. Stand the assembly on edge and nail the assembly together with 16d nails from both sides, staggering and spacing the nails approximately 8 to 10 inches apart as needed. Do this with plywood strips layered between the three 1 1/2-inch-by-11 1/2-inch boards. The assembled header can be clamped or laid flat under a weight to allow the glue to dry thoroughly. Once the glue has dried, the header is ready to be cut to length and installed in wall framing. Paul Massey has been writing since 2009, drawing on a 35-year career in the construction industry. His experience includes 15 years as a general building contractor specializing in architectural design, custom homes, commercial development and historic renovations.